TETHERED to my space ship, inspecting the dials and gripping the controls, I readied myself for battle. My flight crew regaled me with stories of my last death as the machine burst forward, barreling down a tunnel and ejecting into space. Joysticks moved me left, right, twisted my ship on its axis, spun it around, and made it skim an asteroid. That’s when my legs began to wobble. My eyes told me the horizon had moved, yet my brain told me I was still standing in my lounge room wearing a headset and clutching a game controller. Sony launched its first virtual reality headset for the PlayStation today, and it’s quite literally a game-changer. PlayStation VR is not the first virtual reality system but it boasts advantages others cannot match, including advanced graphics at a cheaper price, and a wealth of titles delivered through a games console many Americans already own. It has disadvantages too, and not just those causing wobbly legs.So the multi-million dollar question is, should you buy it? We put it through its paces to find out. If you think the future is wireless, you’ll be disappointed with PlayStation VR right out of the box. It is a tangle of cords.Not only is the headset connected to a thick cord, but it’s attached to an additional processor — a small black box.When fully installed, this box has five cords running from it, connecting it to the headset, the TV, the console, and a power point. It is hard to hide in an entertainment unit.Put the headset on, however, and you’re likely to forget how messy it looks. 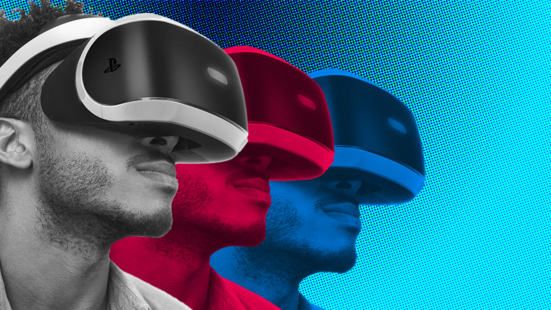 The PlayStation VR headset first big advantage is just how comfortable it is to wear.It doesn’t heat up, like phone-based VR, and it doesn’t crush your spectacles, like Oculus Rift or HTC Vive.It consists of an adjustable plastic strap that sits like a crown on your head, and a visor that be positioned into a comfortable position, to block out external light while keeping your glasses intact, should you wear them. Users look through two lenses to the headset’s 5.7-inch OLED screen that offers graphics in full high-definition over both eyes, and a 100-degree view of the action.To see more, users simply move their head around the room, looking at detail on the floor, the ceiling, or behind them.Head movements are tracked by a PlayStation camera, a separate item connected to the console.The VR effect is compelling and, after a few moments of adjustment, you really feel like you’re inside a game. Playing quirky title Job Simulator, I was transported into an Office Space-like environment with all the 1990s’ technology you could want, from fax machines to dial-up internet connections. Only when I failed to retrieve the right chocolate bar from the virtual vending machine did I remember I was actually pawing at the air over my couch. The detail in PlayStation VR games varies significantly in each title, and it doesn’t match that of its Oculus and HTC rivals, which offer more resolution and use more computing power. PlayStation VR does offer the same or better video refresh rates at 90 or 120Hz, however, which should help anyone who struggles to stomach virtual reality. Sony also adds a feature called Social Screen, which mirrors what the player sees on the TV screen. It effectively means no one in the room is excluded from play. Sony’s gaming advantage cannot be overstated in the virtual reality space. More than 230 developers and publishers have committed to producing VR games for this headset, giving new buyers plenty of choice. My aforementioned intergalactic travels took place inside Eve: Valkyrie, which is an impressively detailed flying and fighting adventure, Battlezone delivers even more combat, Until Daw: Rush of Blood involves riding a rollercoaster surrounded by zombies, and Driveclub VR lets you experience immersive track races. Other titles include Batman: Arkham VR, the spooky Here They Lie, Gran Turismo Sport, and Headmaster, a surprisingly addictive game that involves repeatedly heading soccer balls into targets. PlayStation VR is the cheapest advanced virtual reality system on the market, but it’s not cheap. In addition to buying the headset, you’ll need the $55 for PlayStation 4 Camera, and the $99 motion-tracked Move controllers to make the most of some games. If you don’t own these already, your $399 purchase will quickly blow out to $600+. The entire Playstation kit, including a console, will set you back $650. PlayStation’s VR system also doesn’t track you when you turn away from its camera, graphics aren’t as crisp as some PS4 games, and you’ll need to be careful to keep your hair away from the headset’s lenses as they smear easily. There’s a reason Sony’s VR headset sold out in Parts of America and countries like Australia etc. The PlayStation’s take on virtual reality is comfortable, advanced, accessible, and compelling. The number and variety of games will keep people coming back to this accessory, and it inarguably takes video games to a new level. There will be moments of motion sickness for some players, others will opt for the higher resolution of more expensive systems, and some will bemoan its tangled appearance, but PlayStation VR has the greatest chance of making virtual reality mainstream, and sending many players into space. Sony bosses never instructed anyone to develop a virtual reality headset – it all came about from engineers tinkering in a lab building it on the quiet. PlayStation VR is the lovechild of PlayStation Move and EyeToy, and it took five and a half years to develop. PlayStation VR isn’t being treated like a new console by Sony, and Layden claims there is no plan to try and replace the way we currently play games. At least not anytime soon. There’s a huge effort to ensure that there’s not a game drought post-launch. Expect a steady flow of new titles.